For those of you who are planning to purchase puppies this coming holiday season, please give this idea a lot of thought before you make that final decision. Puppies are a lot of work! Ask yourself if you will have the time to devote to this new baby in order to get him housetrained properly. Will you be able to take him for potty breaks every 1/2 hour to 45 minutes throughout everyday? If you are planning to keep puppy in a crate for 8 hours every weekday while you’re at work, your puppy will not be able to hold his water or bowels for long. Puppies have a bladder the size of a pea! Puppy may wind up soiling his crate and get very upset about having to sleep in a mess. Not only that, puppies should not be kept confined for that length of time without having a few breaks throughout the day to exercise, socialize, play and potty. Puppies need to be thoroughly socialized. They need to meet a lot of people by the time they are 12 weeks old! They need to visit all sorts of different places and hear a variety of sounds, and walk on many different surfaces. And… they must play with several healthy, friendly and vaccinated puppies and dogs before that 12 week period is over (consider puppy class)! 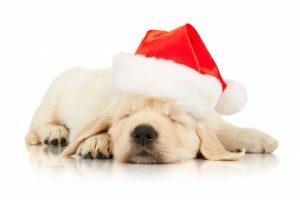 Will you have the time to devote to getting your pup sufficiently socialized throughout this holiday season? If not, you might wind up with a dog that becomes shy or fearful of everyone and everything he was not exposed to during that short window of socialization. Sadly, June of every year is a month when shelters begin to see 6-month old dogs being surrendered. These were the puppies that were purchased or adopted during the holiday season. People surrender their dogs at this age because (1) they are now showing shy, fearful and aggressive behaviors due to insufficient socialization, (2) they have not been completely housetrained because nobody had the time to get the dog out often enough for potty breaks, and (3) the novelty of having a puppy has now worn off once everyone realizes how much time and work is involved to raise a puppy. Believe me, it is just as much work as raising a baby. It is best not to purchase a puppy as a gift. I can’t tell you how many people have called me in January of each year for help with their puppies, and admit they really didn’t want it. If you want to give someone a puppy as a gift, let them pick the puppy out. If they tell you they do not want a puppy, don’t go ahead and get it for them anyway thinking they’ll fall in love with it! Most people don’t! If you are seriously wanting to add a puppy to your family, consider getting him/her in the spring or early summer when the weather is 100% better for taking puppy out for potty breaks, and socializing the puppy with its world. This entry was posted in Uncategorized on November 15, 2018 by renee.